The Tin Man knew what to ask for... OIL! OIL! 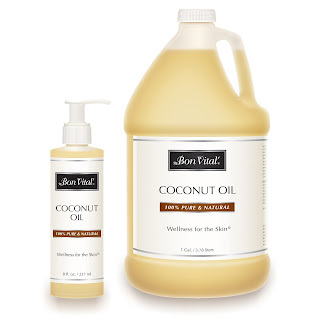 Bon Vital' Coconut Oil, Sesame Seed Oil and Rice Bran Oil are Massage Heaven! There are a lot of massage oils on the market so it takes something unusual to pique my interest. Sometimes is is something fancy, high tech and new and sometimes it is simply getting back to basics. Pure Spa Direct recently added Bon Vital' Coconut Oil , Sesame Seed Oil and Rice Bran Oil... and they do just that, get back to basics... basics from thousands of years ago! These oils are cold compressed to ensure the highest amount of vitamins and minerals, 100% pure, and of the highest grade. Bon Vital' Oils are some of the most requested products of today’s market. These oils offer uncompromising performance that nourishes, smoothes, and softens the skin. No Nut Oils. Paraben Free! Bon Vital' Coconut Oil - has a rich, thick consistency with a tremendous glide made from a refined form of pure coconut oil. Great for blending with your favorite Bon Vital' essential oils. No greasy feel. Unscented. Bon Vital' Sesame Seed Oil - This lightweight oil has been used for thousands of years. Absorbs quickly into the skin, providing lots of grip and control with little glide. Cold pressed to maintain the highest amount of vitamins. Excellent for all modalities. Bon Vital' Rice Bran Oil - Used for centuries to keep skin soft and smooth, and known as one of nature's best beauty secrets. Full of Vitamin E and many other antioxidants. This lightweight oil absorbs quickly into the skin, providing lots of grip and control with little glide. Excellent for all modalities.